Many years at the Annual Gathering, open spaces are provided for laying out temporary labyrinths. 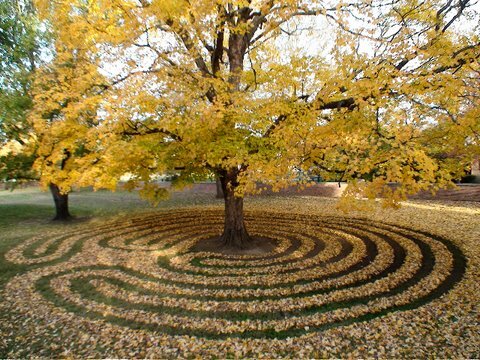 We invite members to build temporary labyrinths on the grounds of our Gathering venues. Space typically allows for a limited number. Anyone interested in this opportunity will be asked to submit a request. If there is sufficient space, locations may be available for spontaneous labyrinths to make an appearance. Plan to bring an 8 ½” x 11” laminated sign or a page in a sheet protector to be placed next to your labyrinth. The information should include the name of the labyrinth, your name and, if applicable, the purpose for which the labyrinth was designed. NOTE: Builders must bring all their own materials and tools, and are responsible for removing the labyrinth at the end of the Gathering. Personal: Your name, place of residence, and a brief description of your labyrinth activities. Proposed Labyrinth: size, type, materials to be used, any special considerations such as electricity needed. If you have questions, contact coordinator, Dan Niven.